This was an interesting experience for me. Growing up as a Blue Jays fan, my heart was ripped out in my tender formative years when the Oakland A’s nearly swept the Blue Jays 4 games to 1 in the 1989 ALCS. To add insult to injury, I had read that upon shutting the door on Toronto, A’s closer Dennis Eckersley turned towards the Blue Jays dugout and flipped the team the bird. I seethed. I wanted him dead. Scratch that – I wanted the whole team dead. From that point on I hated the Oakland Athletics and always would. I took great pleasure in the fact that the A’s struggled through the mid-to-late 1990’s. I revelled in it. When they failed in the playoffs in the early 2000’s, I relished it. Currently they are in a weak division yet still have no hope of making the playoffs. I take extreme gratification in it. Or so I thought. Until I made it to the Coliseum. Initially, I didn’t even plan to come to the Coliseum on my west coast swing – that’s how little I thought of it. Lucky for me the Blue Jays happened to be in Oakland when I was so I changed my mind. 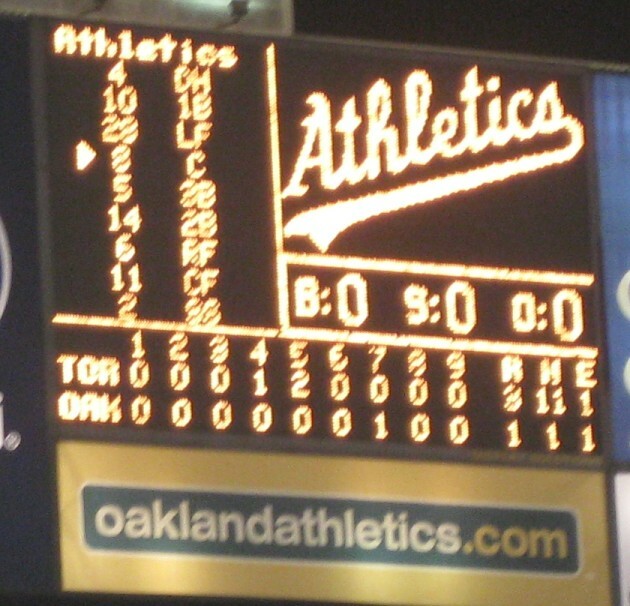 I say lucky because I was able to witness a near no-hitter from Shaun Marcum, broken up by a single Conor Jackson HR. I believe my perspective of the Coliseum would have been a lot different had I not been taken on a guided tour by the Oakland A’s biggest fan, @ElliNSweeneyD (this translates to Ellis & Sweeney D, named after the defensive stylings of A’s players Mark Ellis and Ryan Sweeney). Heading to the ballpark my expectations couldn’t have been lower. 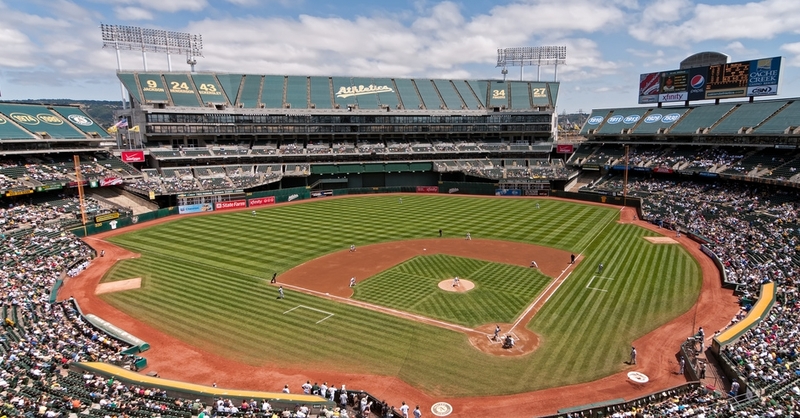 The Coliseum has consistently been ranked as the worst ballpark in all of baseball. Visiting team announcers carve it to bits. On television it looks dreadful. As I drove through the neighbourhood that surrounds the Coliseum, I was surprised how much of a barren wasteland it is. There is no party zone around here. The ballpark is located between two freeways and it looks more like a war zone. It is a ballpark for the bridge and tunnel posse, if you will. I parked my car and quickly made my way to the ballpark, a circular stadium that was clearly designed with football in mind as much as baseball. The Raiders of the NFL are also current tennants of the Coliseum. 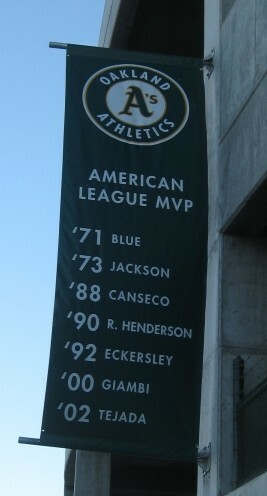 Walking the perimeter of the Coliseum on my way to will-call to pick up the ticket that ElliNSweeneyD left for me, I noticed many banners hanging from the concrete exterior of the run-down, outdated ballpark. When I saw all of these tributes to the A’s rich and storied history, I felt a pang of pity for the team I loathe so much. It was here that I began to draw the first parallel to the A’s and my own team, the Blue Jays. They both possess some pretty impressive accomplishments. But what have they done for their fans lately? Not much. 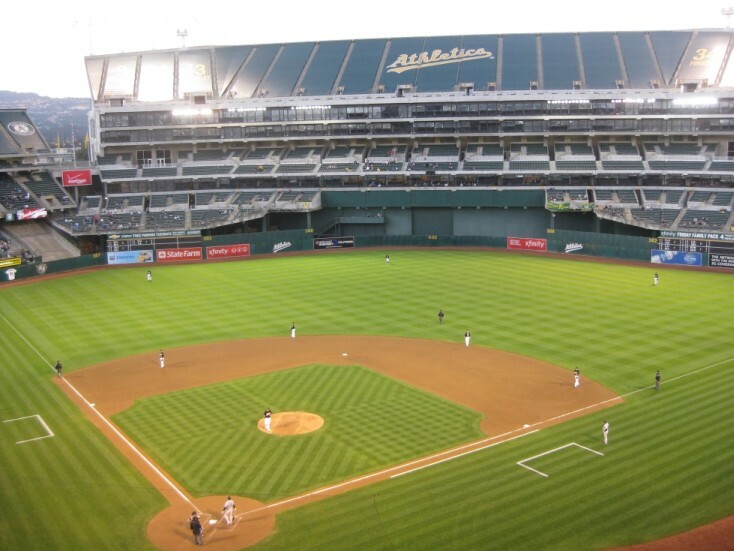 The Oakland A’s moved to the Coliseum in 1968 after moving from Kansas City and Philadelphia before that. After moving to Oakland the team began to find success, led by stars such as Reggie Jackson, Rollie Fingers & Catfish Hunter. The A’s do a good job of paying homage to these past greats with murals and pictures throughout the different concourses, though I did need my trusty tour guide to point them out to me as some are in hidden nooks & crannies. Like the SkyDome, the Coliseum’s seats are laid out in a circle with the seats not necessarily angled towards the diamond. 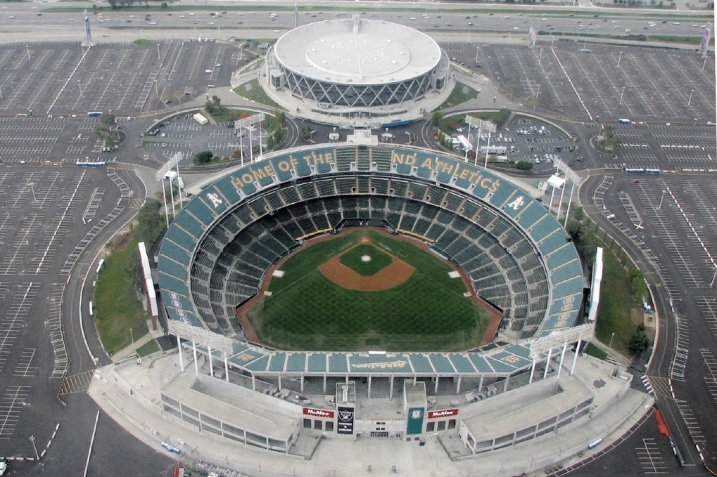 In order for the Raiders to return to Oakland from Los Angeles, an agreement was reached to increase the capacity of the ballpark from 54, 500 to 63, 000. As a result the centrefield bleachers were demolished, markedly degrading the baseball experience. Where a grassy slope and trees used to stand now lies thousands of empty seats in plain view. This creates a cavernous and unpleasant ambience. However, the expansion didn’t turn out to be all bad. The outfield fence was altered to create some interesting angles, including a 15 foot high fence in the power alleys. The distance to the RF power alley is the shortest in all of baseball at 362 feet. As well the foul territory is enormous, perhaps the biggest in all of Major League Baseball. This means the action on the field is much too far away, even from the good seats. With all those extra seats the A’s were able to do something pretty neat. On the rightfield side of the upper deck they honour the World Series championships that the franchise won when located in Philadelphia. The leftfield side displays the Oakland ones. The field itself looks pretty good, similar to AT&T Park across the Bay. The grass is an beautiful shade of green and the field well manicured. People often refer to the SkyDome is a concrete toilet bowl, but that description is more apt when applied to the Oakland Coliseum. It is stiff and bland. Architecturally this is the most unimaginative park I’ve been to. There is nothing to look at, no statues, no signs, no clocks, no artifacts. Nothing. Just stained concrete walls. The theme carries on inside. Bleak, dimly lit concrete concourses (I would prefer to call them corridors) with most of the concessions closed and covered up by ugly aluminum garage doors. If you are able to find a concession that’s open then you are in luck. The Coliseum is home to some of the best hotdogs and sausages in all of baseball. I tried the sweet italian sausage with onions and peppers. The onions were a little “limp” as @EllinSweeneyD pointed out to me, but the total package itself was delicious. Apart from the typical fare there isn’t much variety for food options. None that I could find, at least. They do have garlic fries but I was too scarred from my bad experience at AT&T to give them a go. Surprisingly, there is a Windows Restaurant-type place on one of the upper levels. It is pretty bare bones but is open to everyone. While there may not be a variety of concession items, there is a vast selection of beers. All of the typical American brews: the Anheuser/Busch conglomerate, smaller brews like Sam Adams & Sierra Nevada as well as imports like Guinness and Dos Equis. The scoreboard in this ballpark is terrible. There are 2 of them and are not worth mentioning. The only way to make them look good was to put the box score of Shaun Marcum’s one-hitter on them. The team store is about the size of my bathroom with a terrible selection of merchandise. Very disappointing. But they do sell stuffed elephants as a tribute to John McGraw’s famous quote. The usher staff were very pleasant, helpful and engaging. Almost all were on a first-name basis with @ElliNSweeneyD. They even hugged it out once or twice if I am not mistaken. Though I imagine that happens when there aren’t that many fans to speak of, the opportunity is afforded to build one-on-one relationships. 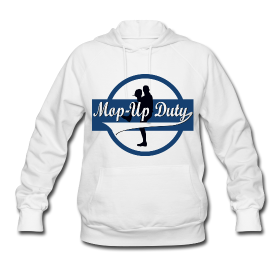 @ElliNSweeneyD and her crüe have established a relationship with the A’s outfielders. Much like the bleacher creatures in Yankee Stadium, these A’s fans have established a call and response system with the players. Of course, they don’t give credit to the bleacher creatures for starting the fad. This brings me to the fans of the Oakland A’s. They are an extraordinarily small bunch but they are smart and rabid. After @ElliNSweeneyD’s personal tour and seeing the passion in those Oakland fans, I began to identify with them – shockingly enough. I hated them in the 80’s for their World Series win in 1989 and the “Bash Brothers.” Yet my team was the subject of great hatred for the back to back championships in 1992/93 and “WAMCO” (White, Alomar, Molitor, Carter, Olerud). Like the SkyDome, the Coliseum is misunderstood. When seen through the eyes of a true fan, it’s not such a bad ballpark after all. Oakland fans make the most of what they’ve got. That is something I can relate to and appreciate. I no longer hate the A’s but sympathize with their fans. At the end of the night I felt bittersweet about the Marcum one-hitter. It was sad to have to do it to the A’s. Frankly it is a tragedy that a storied franchise such as the Athletics is saddled with such a shady ownership group in addition to the lacklustre ballpark. They are, after all, 5th all time in World Series appearances with 14. They deserve better. After being dumped on consistently, their fans deserve better. @ElliNSweeneyD deserves better. To them I say good luck, and keep supporting your team. Your A’s are lucky to have fans like you. A theme you come up with assymetrical distances and wall height. Why do you find this interesting? It causes difficulties for the visiting team ‘s defence, sometimes the home team. The different wall heights and angles can turn doubles into triples and inside-the-park home runs. This sets up the possibility of outstanding defensive plays or blunders which are interesting, more often than not. The best call and response is that fat handicapped guy with a loud hi pitched voice who sits behind the visitor bullpen at the RC and says “hi” to every player, on the field, in either bullpen, on either team, in either dugout. This usually takes 2 innings the guy is exhausted by then. I’m glad you got to see a great game by your boys, and you were an absolute joy to show around. Thanks for being respectful to my favorite home, even if the owners aren’t. P.S. You forgot to mention that some of the elephants make awesome trumpet sounds and are puppets. 😉 I know you were jealous. I tagged along to a Raider game last year and i also felt sorry for them, so much history and such a dump. 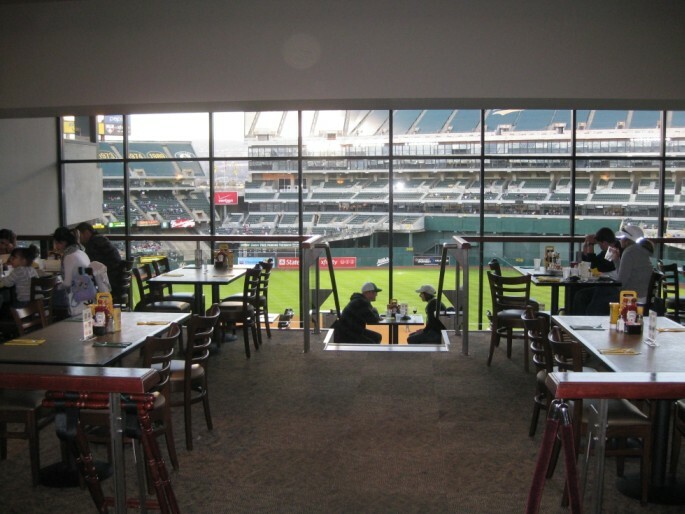 I also laughed at the Raiders for leaving LA to play in a place like that 😛 No wonder the A’s want to bolt to San Jose, but one of the bright spots is that with a small bowl, smaller sections and no million levels of luxury boxes, the team being the 2nd team in the area, you should find very good seats all the time for a good price. Also no “moat” that keeps fans even further back by placing a VIP section behind the plate.